When people ask me what my parents-in-law-to-be do for a living, I usually just say that they “Build Pools”. In terms of understatement, that description almost borders on insulting. Their company Natare (@NatareCorp) just finished creating the most impressive pool I’ve ever seen. This pool is three times the size of an Olympic pool, 55 stories high, and spans three towers. The engineering complexity of such a project is staggering; the pool joints have to handle stretching, compression, and torsion and the pool itself is designed to prevents waves forming – something that could be catastrophic in a pool like this. 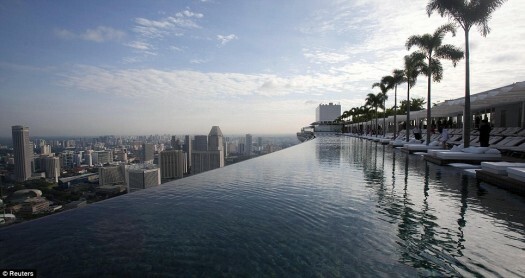 Natare's Infinity Pool on top of the Marina Bay Sands, Singapore - Nice View! This entry was posted in inspiration and tagged amazing, marina bay sands, natare, pool, singapore. Bookmark the permalink.